Edward Prendick is travelling in the South Pacific when his ship goes down. He is saved after many days at sea by another ship, and a passenger, Montgomery, nurses him back to health. Prendick becomes interested in the mystery of Montgomery’s life. Why does he live on an unknown Pacific island? Why is he taking animals there? 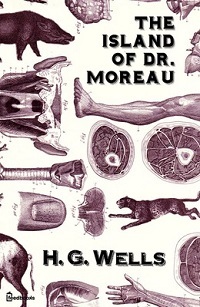 And should Prendick fear the dark secrets of Montgomery’s master – the even more mysterious Doctor Moreau?